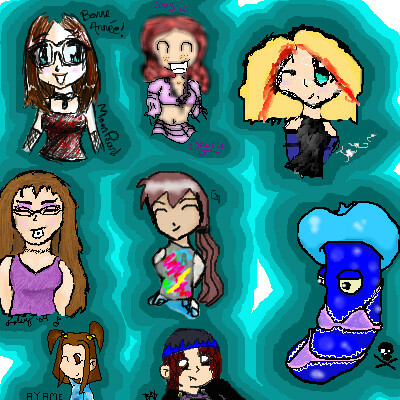 2draw.net - boards - Collaborations - Chibies of the New Year! boardscollaborationsChibies of the New Year! Hey, seeing the big Collab of Anthros gave me the idea! Let's draw ourselves as chibies going to a party for the new year (in night clothes). Thanks! Happy New Year You You! I want to join... Can I? Happy new year to all! I want to Join! PLEASE?! Okay! I've added you guys! Let's go and draw! i want to join! :D don't make me beg! Kinda odd of me to ask..but can I join? Hey! Looks good!!! Anyone wants to join us?? 2005; the year of red haired girls in neon purple pirate shirts and mexican skirts. WooT. Aaaw this is so cute and such a great idea! Can I join this? I beg you to add me! please??? Yes, the BlueGuy is the sexiest thing I've ever seen! Hey, There's still some place for others! Who wants to be in? Its Chibi-Brytani! Yay! I'm so cute! Someone wants to do the b/g? Lol! I didn't read that part about us dressing up, But that's my style anyway, so I guess that will do! Lol. Hope the bg turns out ok! That's cute! Why didn't I notice this before? Cha miki wants to do a chibi? ish it too late?? Yeehee... Chibi Miki! I hope da Miki gets added. She be da bestest Chibi! Lol. Since we're at it, can anyone think of any other collabs that we can do? Naw.. I got mine figured out!! yea it is locked. moon-pearl, you have to go to unlock image so people can revise it. I hope this gets finished soon. I have a lot of stuff in my studio currently! please finish soon! Can she set it to finished then? Please? THANK YOU!!! This turned out er... interesting! I'm so jealous I wasn't part of this. You would have made it awesome.